I recently reviewed a great product from Jahgoo. I choose to review their bath tub which retails for $29.99. I really like how the design is really simple but high tech at the same time. It is light weight and also comfortable. This beautiful and comfortable bath is one of a kind. 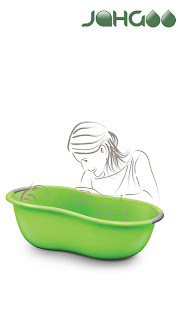 It’s the only bath that provides anti-slip both on the inside as well as on the outside. The bath is equipped with soft grips for easy carrying as well as a plug for fast draining of the water. Its ergonomic design accommodates juveniles up to 3 years. I love how easy it is to use. Just pull it up to the faucet and fill it with water. I did use this with baby but didn't want to show nakey baby on cam. This tub is great! Then just pull the plug when you are done and all the water drains out. Isn't that great. The sides are a great size and will fit a baby up to 3 years old. The bottoms have an anti slip on it so there will be no sliding in your tub. So I would definitely recommend this bath tub to all of my mommy friends. The price is great as well as the design. Thanks to the PR company that sent this item for review. My opinions are honest and I was not paid for this review.